Apple beat the HELL out of estimates a few minutes ago. People might confuse the magnitude of the earnings beat, due to the revenue recognition rule changes I discussed back in September. But it remains the case that this is a big, big beat. Shares are up about four dollars in late trading. In a just-released filing, Apple (AAPL) reported Q1 (Dec 26th was the end of their fiscal first quarter) earnings per share of $3.67 versus the street expectation of $2.07. What is truly ridiculous is that of THIRTY EIGHT wall street analysts covering the stock, the high estimate was still a dollar less than what they reported. Even more insane is that revenue of $15.7billion beat the street high estimate by about $3BILLION dollars. Truly remarkable. 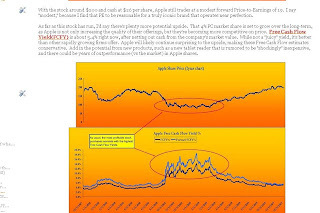 I took a look at Apple in early December in a piece titled "2 and 4, the most important numbers when looking at Apple." I said shares were headed higher, in part due to expected earnings beats like this one. Tomorrow, Wall Street will trip over itself upgrading the stock. Notably, the forward guidance is above expectations, probably catching many by surprise. The tendency is for Apple to give conservative guidance that they can easily beat - but in this instance that conservative "easily-topped" guidance is already above where the street is. So what are the shares worth? I'd say the shares will easily hit the mid 200's this year, as it would imply a mid-teens multiple + cash balance. Using a 2010 estimate for Free Cash Flow Yield of 5% and adding in cash would get me to about $230 per share, but with upside potential from new products and the ever increasing desktop market share Apple is grabbing, this stock could command even better valuation levels. Either way, color me extremely impressed by this performance.